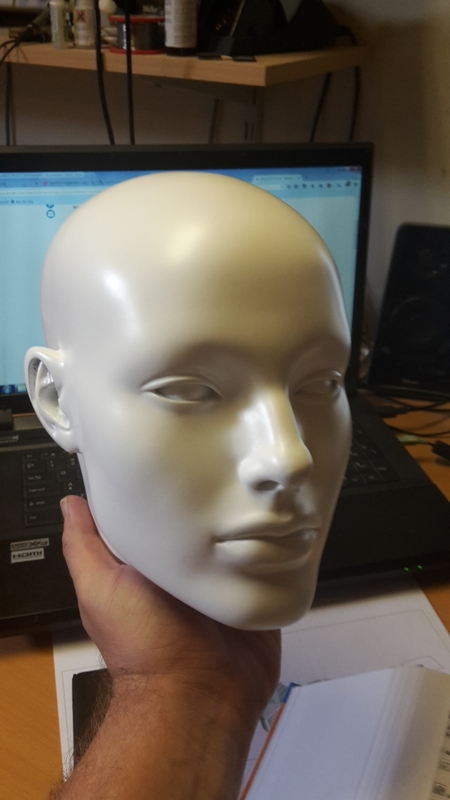 As mentioned during the first lesson, I didn't have a sculpt to work with and less time than I would have hoped to do the fabrication, so to save time, I went online and ordered a polyester mannequin head. 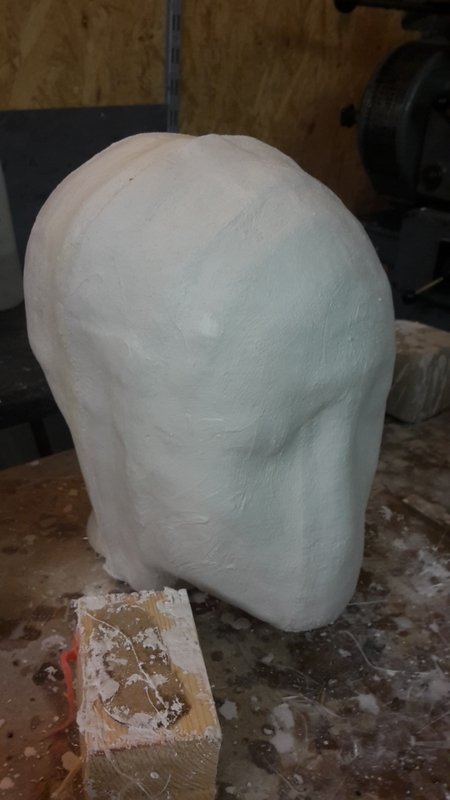 As Craig noted after the class, this could be used as an underskull directly, with the possibility of maybe ordering another one later on, doing a sculpt on top of that and then making the molds for the skin from that. 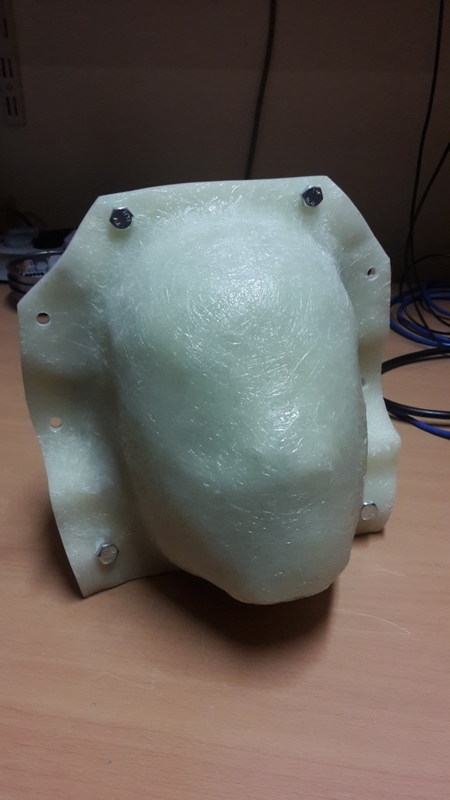 So I had to decide what to do; leave it at that and wait for the next class, or try to use this as a starting point and go throught the process of making a mold, a core and another mold for the underskull. 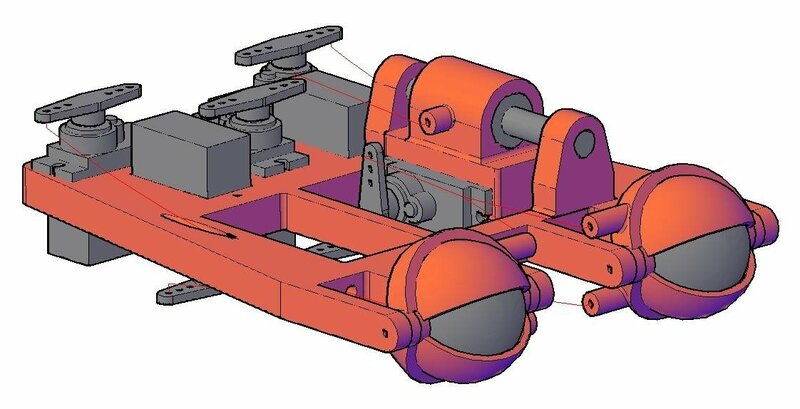 As I got the impression that we would be working on mechanics from here on, I'm hoping that I can do those partially without the underskull and started the process of moldmaking anyway. 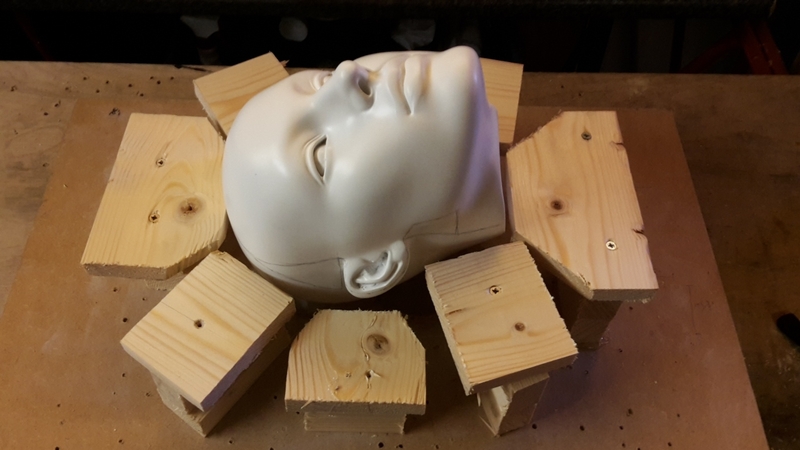 I took the dimensions I would be needing for the next class (distance between the eyes from center to center and the diameter of the eyes I ordered), got / ordered some materials and went to work. Then I made some filler blocks on which I can build up my clay wall. Unfortunately, that's as far as I got. 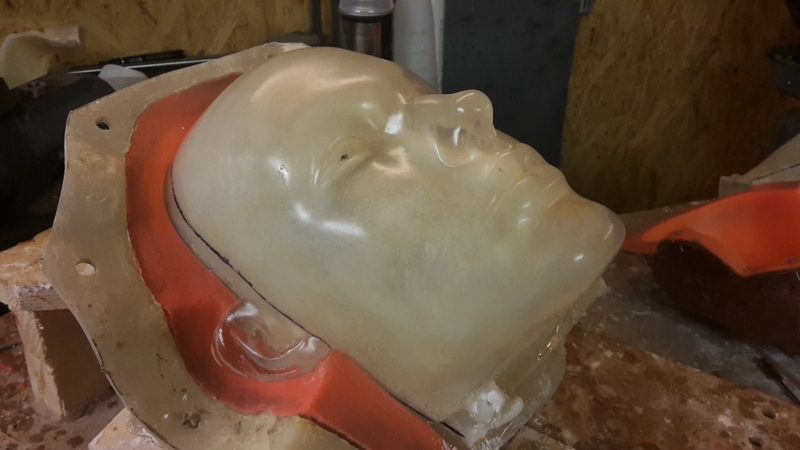 I hope to have some time to at least finish the negative mold (I decided to do a matrix mold out of silicone and glassfibre) before the third class and maybe have some time to work on the eye mechs in between. I've started brushing on the silicone, but now I'm second guessing my decision to cover the flange also. 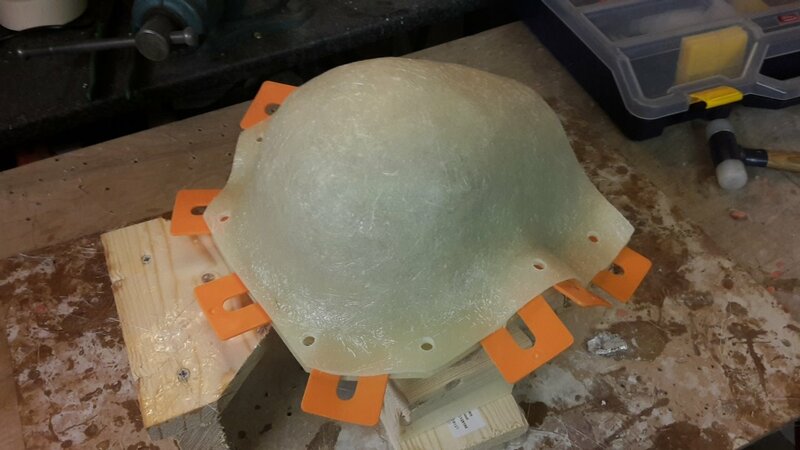 Could it be problematic having a layer of silicone between the flanges of the fibreglass shell? 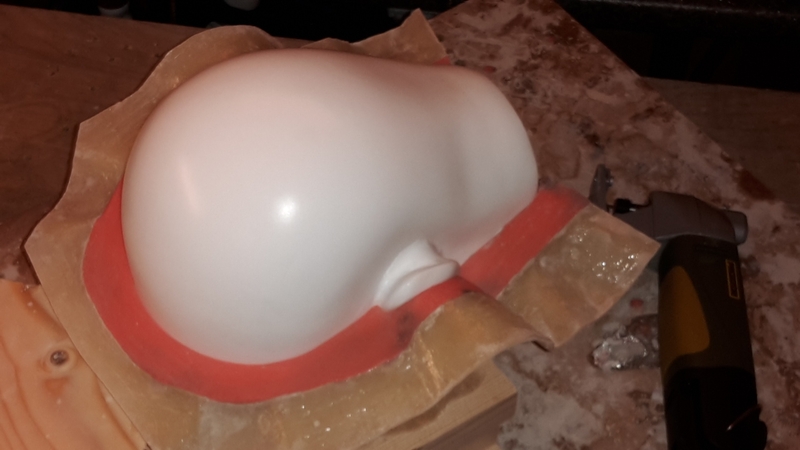 I could try and cut the silicone away before I start laying fibreglass. 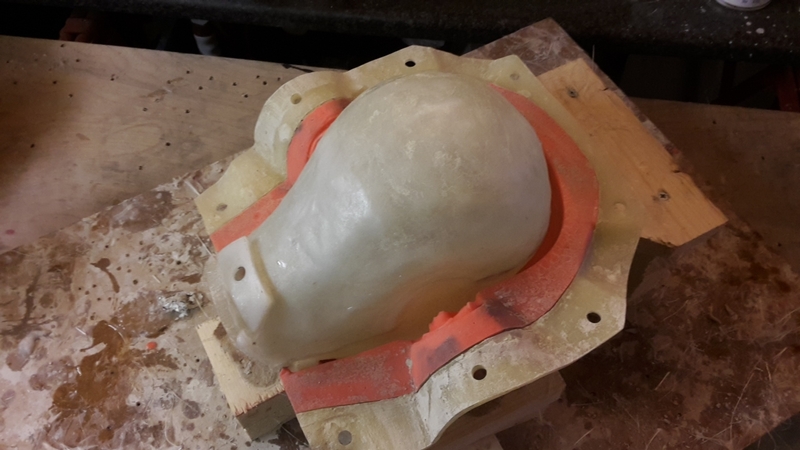 If you're doing a two part mold you'll want the silicone flange other wise your piece may fall inwards. 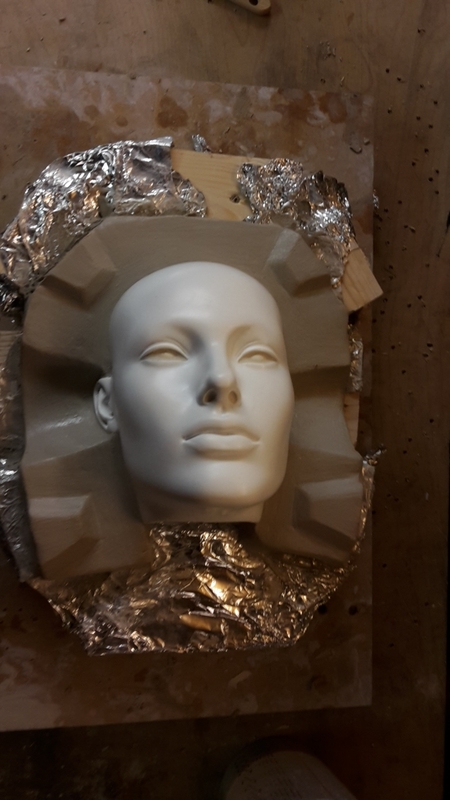 But if you're using silicone for the mold why not just do it all in one piece? That way you don't have a seems to clean up running down the middle of the head? 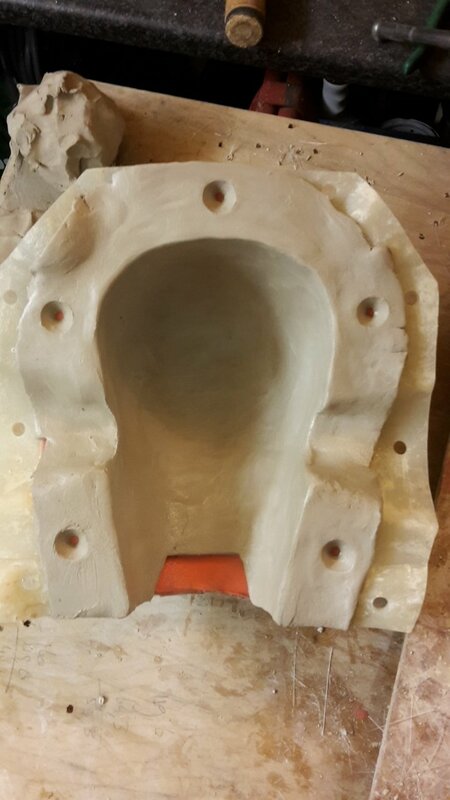 You have a pretty large opening in the neck for pulling in clay for your core mold. If you have trouble getting the mold off the sculpt you can just add a cut seem to the back of the head. Yeah, I'm doing a two piece mold. This is my first try at it and it seemed a bit easier do it this way. Good point about the silicone falling inwards. 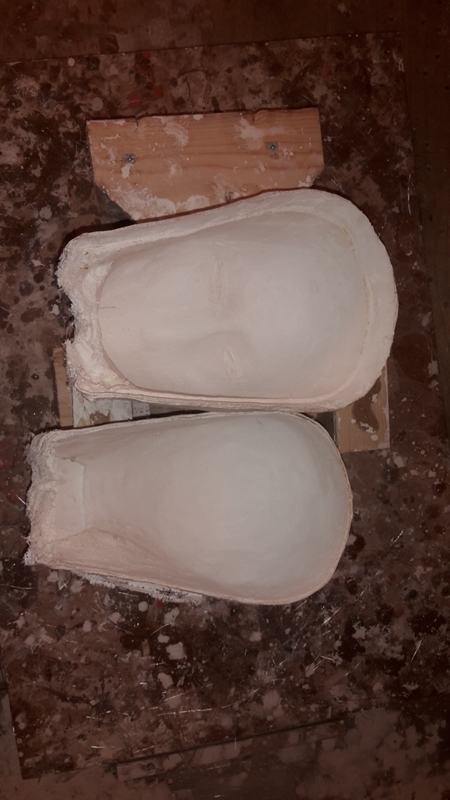 My fear is, that I might compress the silicone too much when tightening up the mold and distorting the cast. 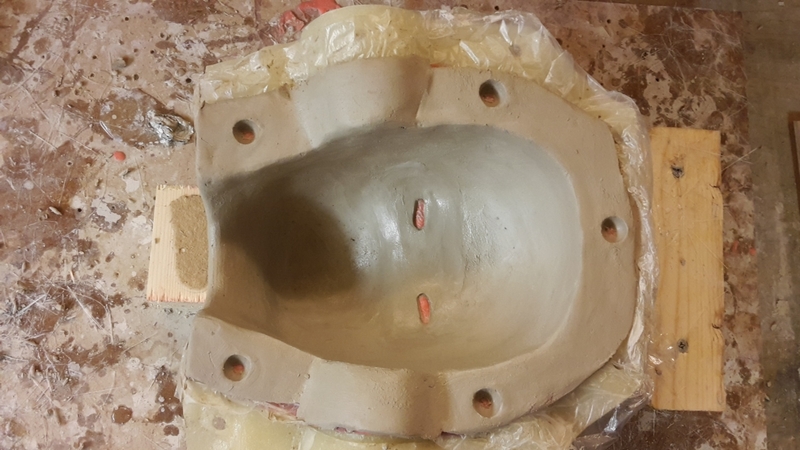 What I could do is just cut away the part that goes over the keys, so the fibreglass will be touching there, whilst there will still be a flange of silicone to keep the silicone parts in place. Yeah, I think that's best to cut the silicone flange like you're saying. 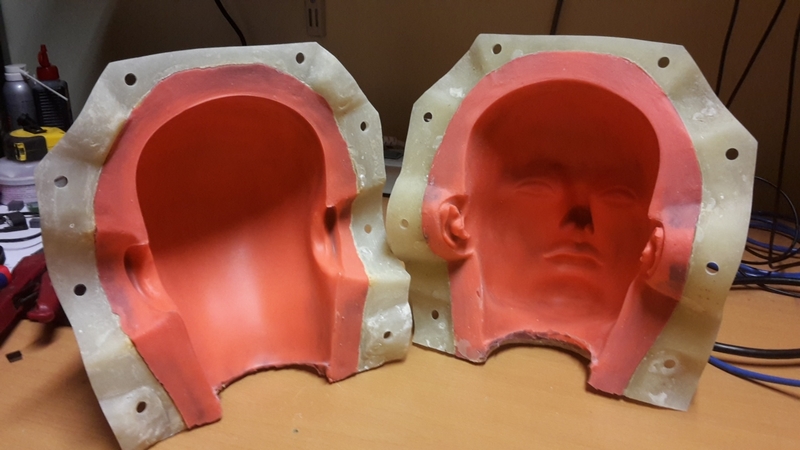 It can be a key in itself to help seat the silicone to the outer shell. 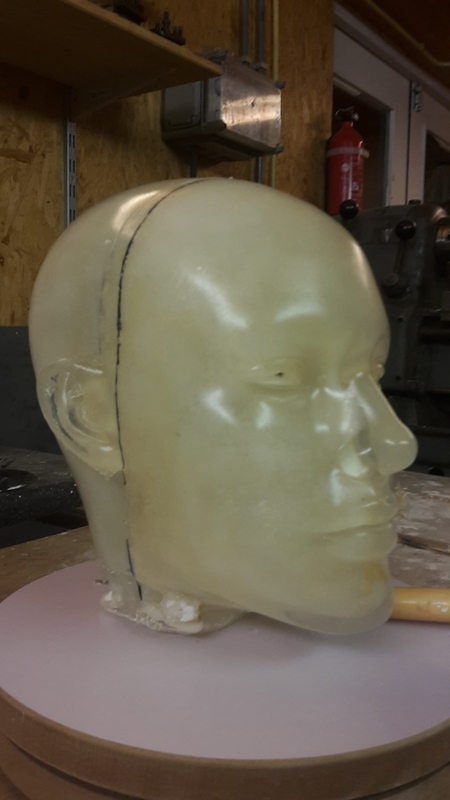 Here's an example of a silicone mold with a single cut seem under the chin. Looks good! I hope mine will come out looking as nice as that. The extra silicone came off smoothly. Next: fibreglass. Last layer of glass for the negative mold is on.Now let's hope I'll get them separated tomorrow. 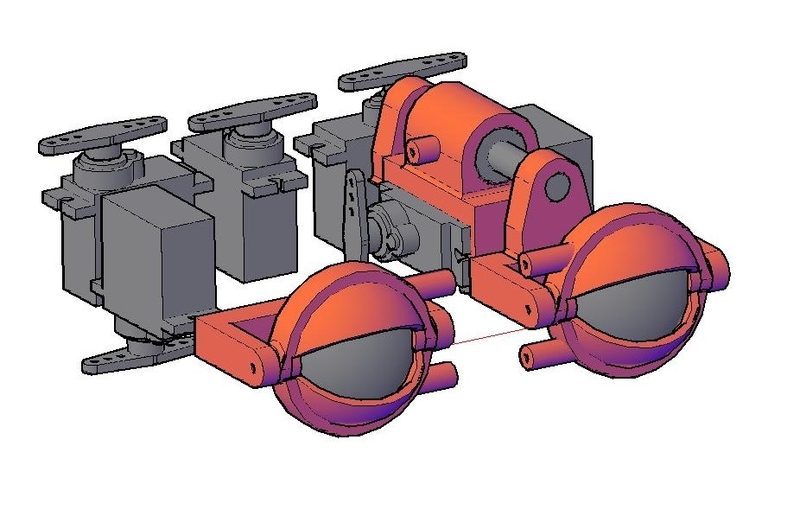 I also started to design my eye mech. It's based on a mech I made earlier. If possible, I'm going to print it. That should save me some time. There are some imperfections, but for a first try, not too shabby! Thanks Craig, it came out better than I could have hoped for! 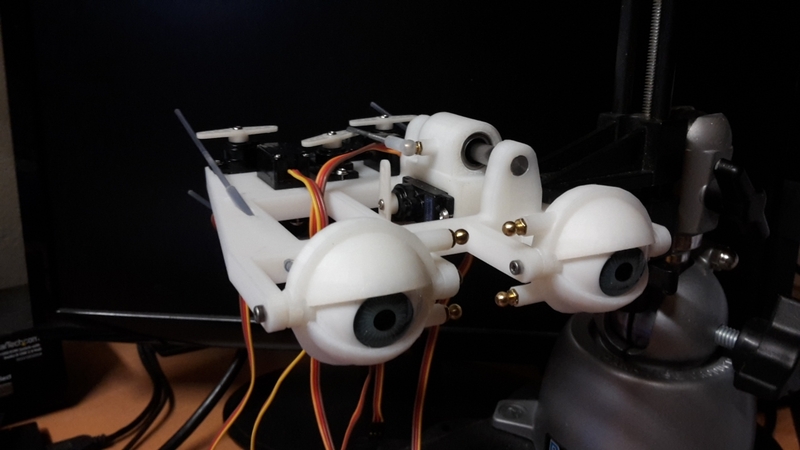 Well, at least the design of my eye mech is finished. Printing will have to wait until tomorrow. 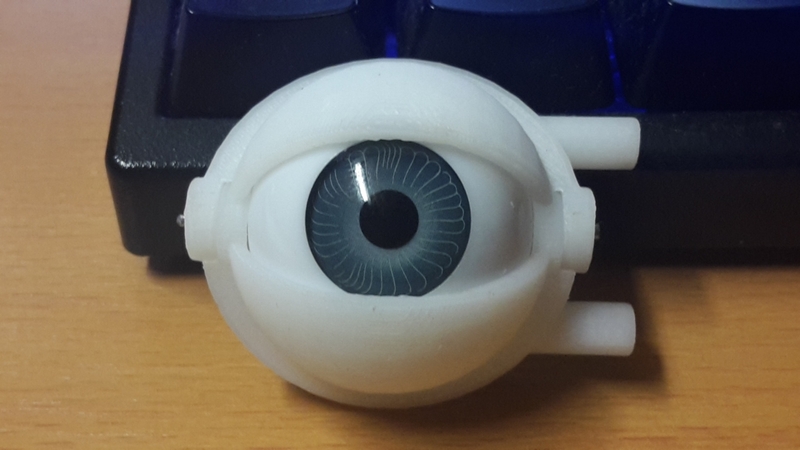 Test print for the eyelids. 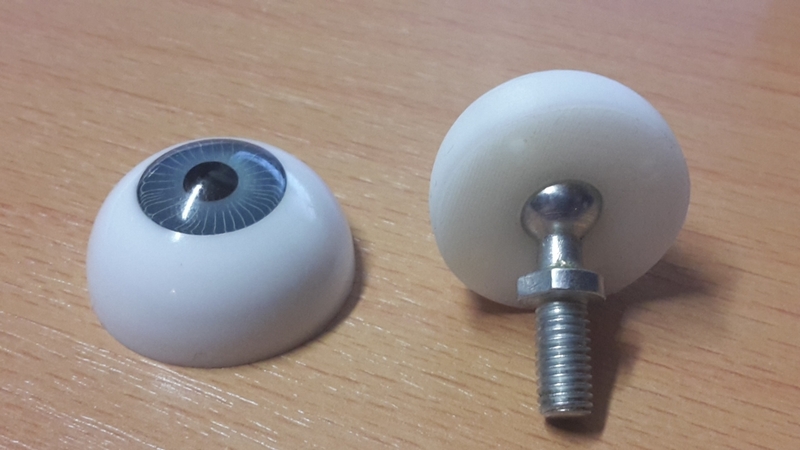 The eyes will rotate on a ball joint. Printing is finished. Now to hook up all the linkages. Same with me. It's just that I thought November would be a slow month, but unfortunately / luckily (depends how you look at it), that isn't turning out to be the case. 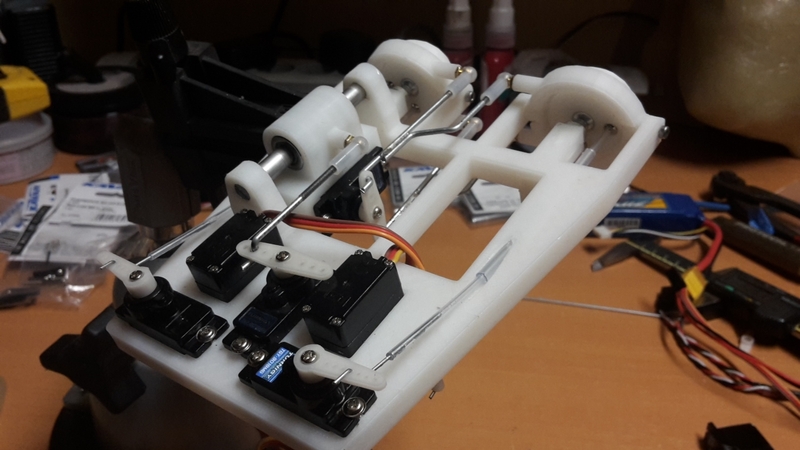 Today I hooked up the linkages and programmed my rc transmitter. Unfortunatily, it turned out that one of the outputs on the receiver has a problem, so I couldn't hook up all the servo's. That's why the up/down movement of the left eye isn't working. 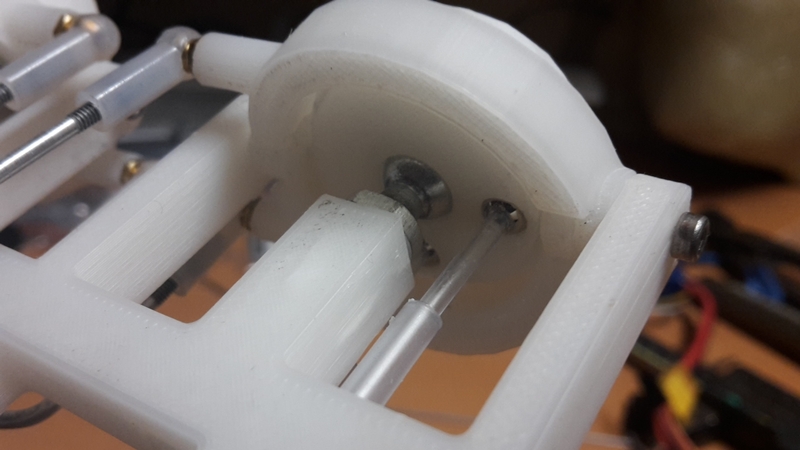 In hindsight, I would have been better off using u-joints instead of ball joints, but they would have been too small to print and I could only find suitable ones in China, which would have taken three weeks to arrive. 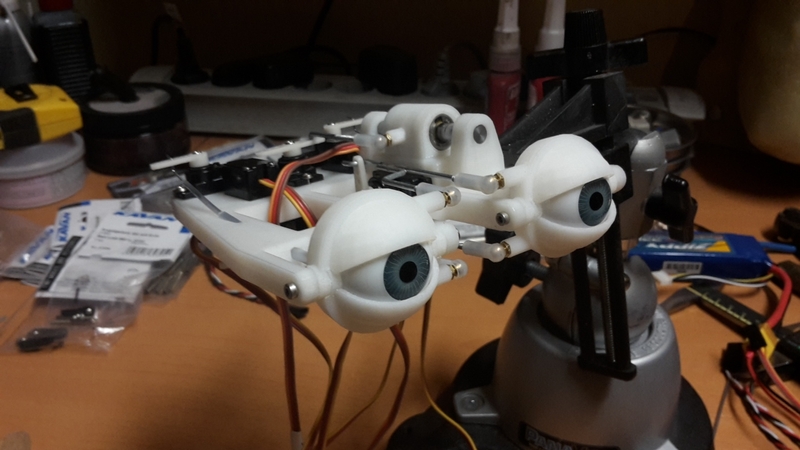 The mech has up/down and right/left movement for the eyes, blinks and eyelid tracking. Your work is always so clean and polished. You'll have to share your secret for the 'no mess' approach. Thing is, I don't have a lot of working space, so I have to keep cleaning up, otherwse I lose all my stuff. And I can't stand having to look for stuff all the time, so I tend to keep my workspace organised. Well, I sorted out the problem with the servo. Turned out to be a setting in the transmitter I changed when I last used it on a quadcopter. Completely forgot about that. Much better this way! I left some contact points where the eyes were in my "sculpt" and I made a key in the back of the neck. I hope that, if I bolt the core to the negative where the key is, It will locate the core correctly. I also put clay on the flange and made a couple of divets in it. The idea being, that hopefully, after I pull out the core, I can position it inside the negative using the contact points, and then draw a line so I know where to trim the core. I sealed the clay with clear acrylic spray paint and put in some mold release for good measure. 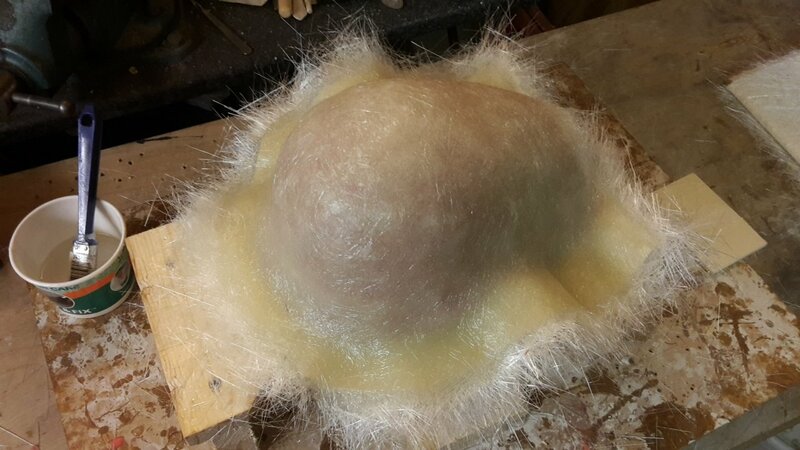 I put in 3 layers of 160 gram fibreglass cloth. Finally managed to finish the core. I had to redo the front part, because it didn't match the rear. I guess I've been a bit too liberal whilst laying in the clay. 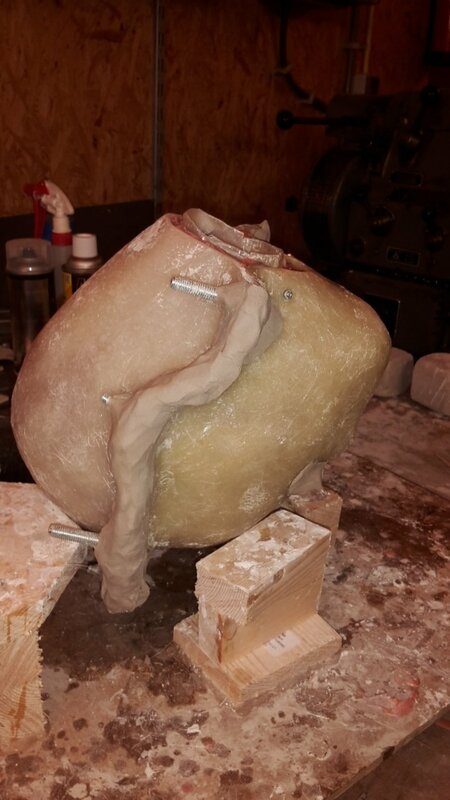 It's still not perfect by a long shot, but hopefully close enough to cast a skin. 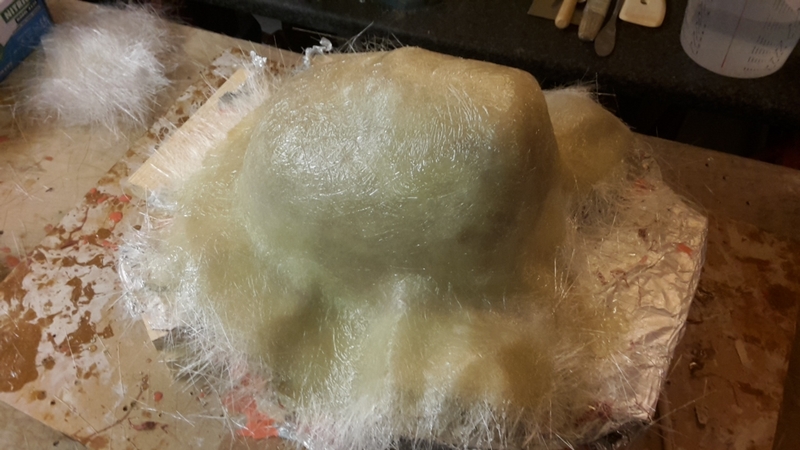 I've put on the plaster bandadges for the throw-away mold for the underkull. It's taking quite long to dry, but I've read somewhere that these could take up to 48 hours to totally cure. Let's hope I can get both halves separated from the core tomorrow or the day after that. The plaster took quite a long time to harden. I don't know if that's because of the brand I bought, or if that's normal, but I managed to get the halves separated from the core. 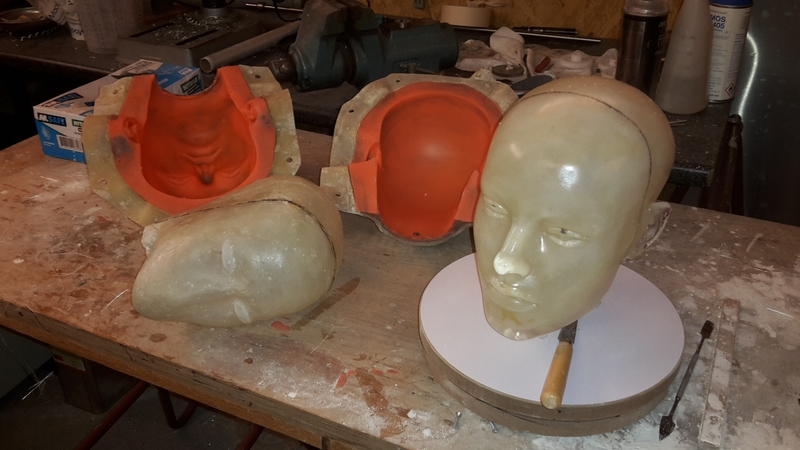 I made the two fibreglass halves for the underskull and, after trimming, put them together, just like I did for the core. 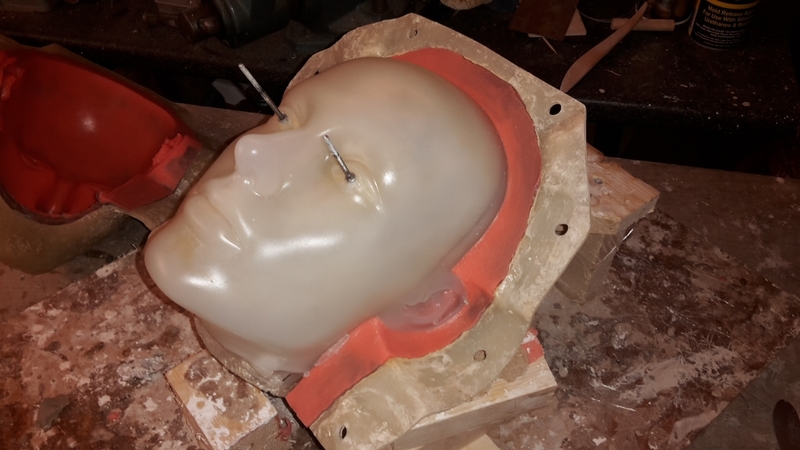 So now, it's time to try and cast a skin, so I can get the eye mechanism positioned correctly in the underskull. 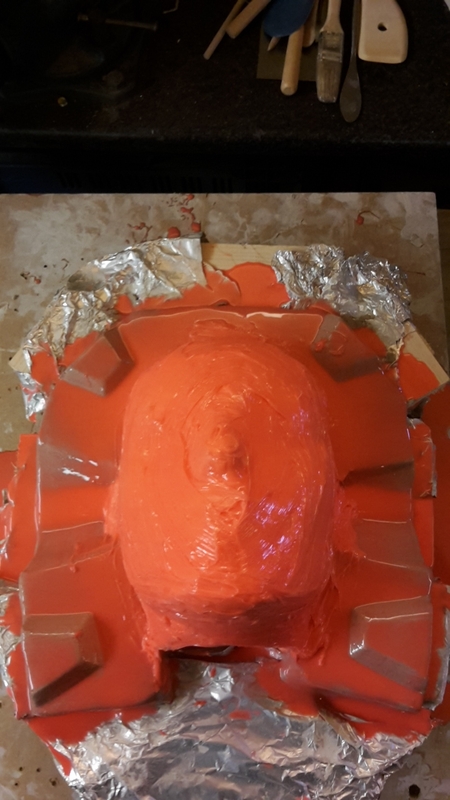 I was a bit nervous about getting the core centered correctly inside the negative mold, so I tried a trick somebody mentioned here; casting a "skin" out of gelatin. 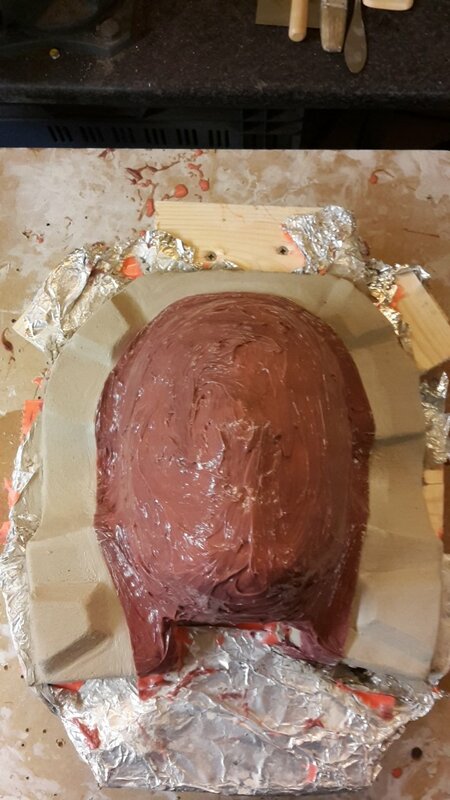 Even though I put a layer of clay around the mold, some of the gelatin still leaked out. Luckily I had some to spare, so I could keep topping it up, untill it stiffenend up enough. I was surprised at the end result, it actually came out looking pretty good, even if I say so myself! Well, that turned out to be a lot of work. But I learned a lot in the process, so that's pretty cool! Glad to see that someone is using the Gelatin skin trick Nice thing is that Gelatin is reusable and easily pulled away from the undermold. Yeah, thanks for the tip! 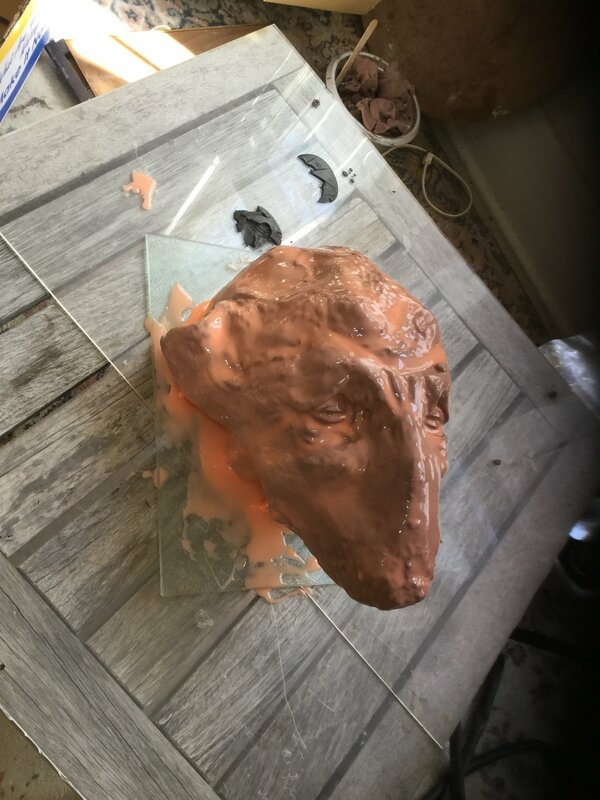 Well, the skin has been cast! I used SmoothOn Ecoflex 00-20 and it worked a treat. 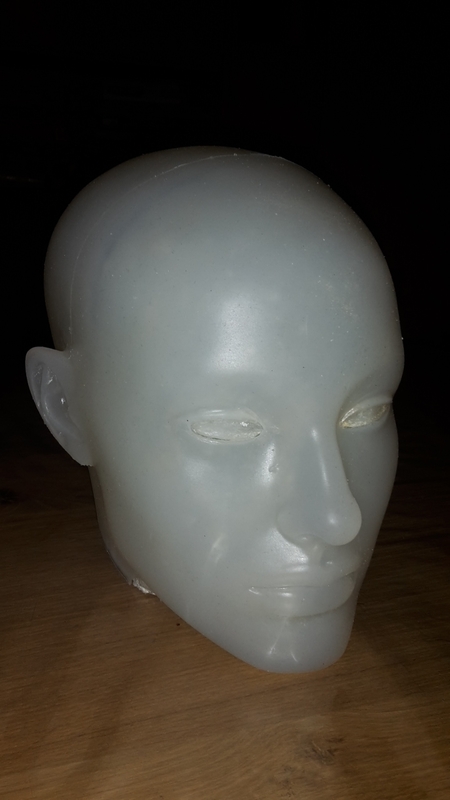 I was a bit nervous if it would release, as I was casting silicone in a silicone mold, but it came out painlessly. Front half removed. I added the pins so I would be sure the core was lined up correctly. 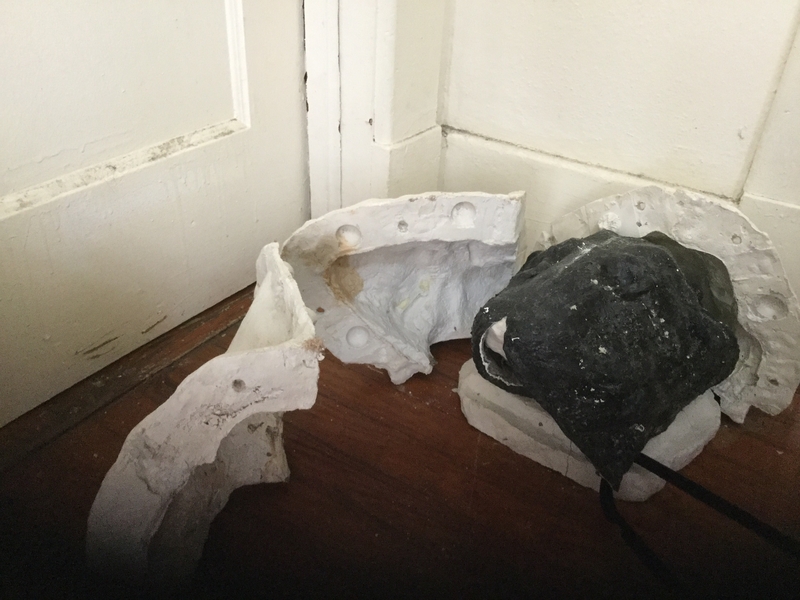 Removed from the core and placed on the underskull.